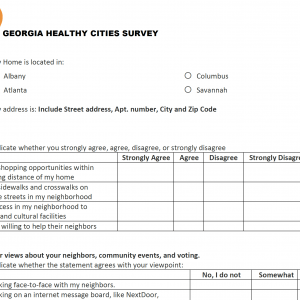 Use one of these options to participate in the Georgia Healthy Cities’ community health survey. 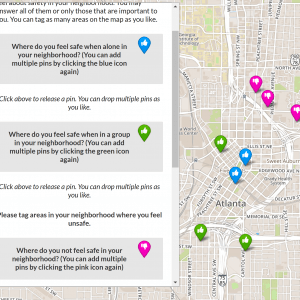 Use this survey tool if you are very comfortable with new mapping technology. Use this survey if you are more comfortable with online survey tools. Print the Health Survey – with no mapping for those who don’t have access to technology and/or prefer to fill out the survey on paper. 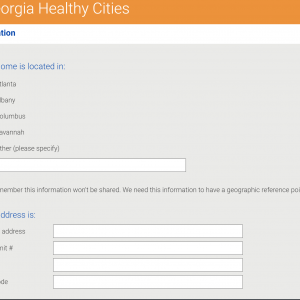 You can later input the answers in the “Health Survey – with no mapping” tool. The printed version is 4 single-side pages or 2 double-sided pages.